I’m here again to offer some great free-side content with another Stock Watch! On our agenda today is a centerpiece of the Modern Twin decks. What could this card be? …It’s none other than Deceiver Exarch! I have been monitoring this card along with a slew of other uncommons since Heritage Druid’s recent spike. In light of this event, it seems that even uncommons in Modern can command a premium! I have reiterated many times that viable Modern stables that don’t get reprinted may end up increasing across the board. Turns out this uncommon is primed for a comeback since its recent reprint. Let’s look further as to why this card could be a great investment right now. Now, TCGPlayer isn’t the end-all-be-all of shopping online, but it’s usually a great way to purchase cards, and offers the nifty option to search for “4 or more”. When stocking up on inventory there’s usually no better place to shop than here, or Star City Games. You can see in the yellow highlights above that there are fewer than 100 sellers between the two printings, and most vendors only have one copy in stock with absurd shipping. What’s happening here is that sellers could capitalize on making a “new” price by simply listing more than one copy. After all, no buyer is really going to want to pay 1.99 shipping on a .50c card. This could start a domino effect because all of these “one-of” sellers could end up pulling the one card in inventory, and suddenly the new price on the card could stick. 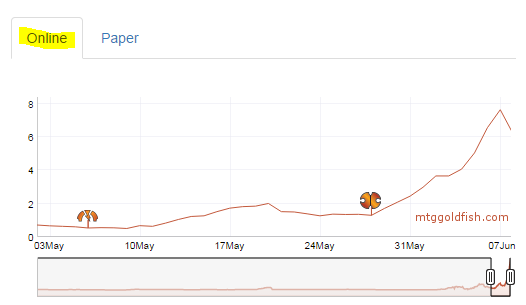 Dissecting the graph we can see this spike on MODO is very recent, and with the popularity of Twin in the online metagame, it seems like a frenzy trying to grab these uncommons. Since the Commander product is rarely opened on there. We know that trends from MODO often end up transferring to paper prices down the line. Added to that fact, with the recent SCG Invitational results and the success of Bloom Titan and R/G Tron, many believe it would be a great time for Twin decks to rise to combat those strategies. Admittedly the spread isn’t that attractive for now. That could soon change once many players start sleeving up Twin archetypes (U/R, Grixis or RUG) and the overall supply on websites continues to dwindle. 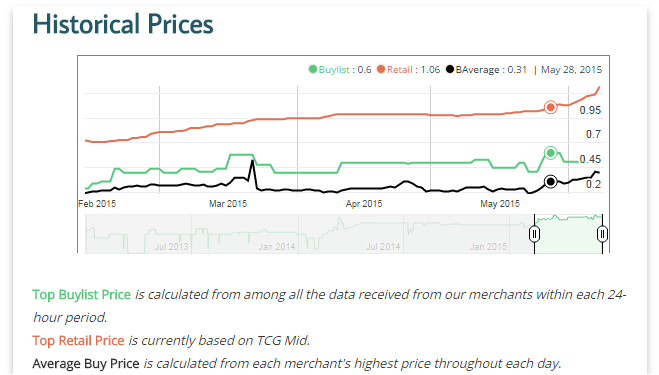 Buylists prices have fluctuated slightly, but nothing to indicate vendors really wanting many copies of this card. So, for now we may hold off, but as for myself, I will be looking for extras very aggressively here shortly. It’s increasingly hard to order more than one copy, and truthfully so many one-of vendors essentially make the card already up to 3-4$ already. 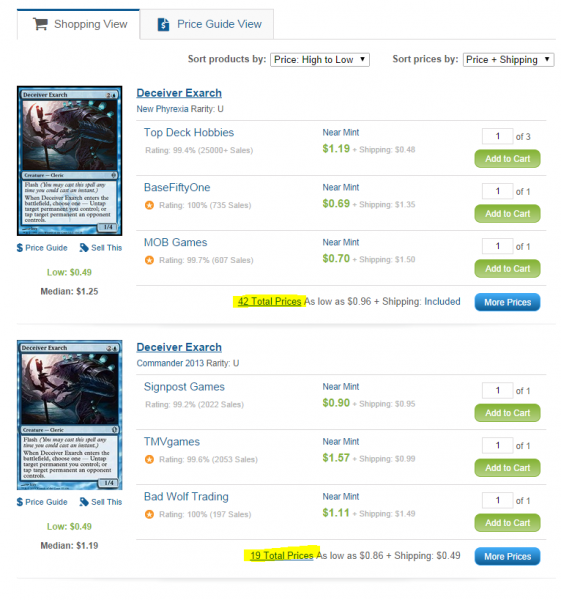 Blame the TCGPlayer algorithm for not taking into account the massive shipping on each of these vendors. Once these vendors start moving these cards or pull them, we could easily see paper prices start to mimic online copies. So, that’s the little update on this card. I urge everyone to keep an eye on such a prime uncommon in the format, as well as many others. It’s really starting to become the Wild West out there, now that so many key cards have been excluded from Modern Masters 2015. Hope this creates great opportunities for you financiers out there!